Sweet Alyssum is a delicate carpet of tiny flowers with a subtle, sweet scent. The low-growing foliage is covered by flowers for much of the growing season. 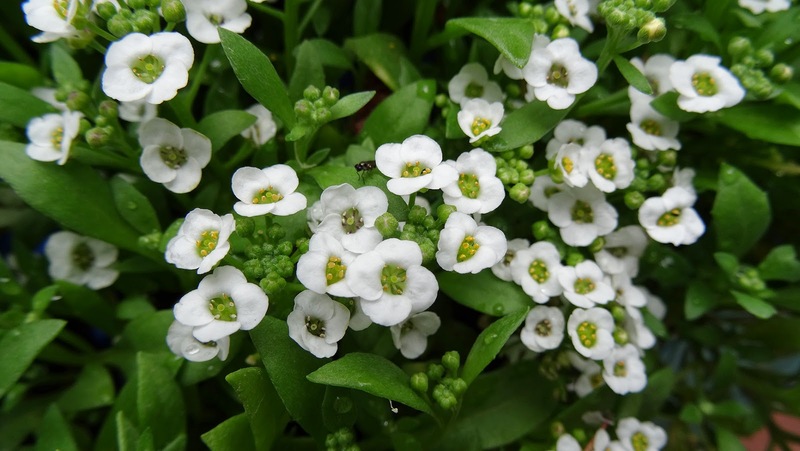 Sweet Alyssum (Lobularia maritima) is very easy to grow, from plant or seed. Sweet Alyssum is a cool season flower that can be set out in early spring are grown throughout the Autumn and Winter, in frost-free climates. Most varieties will fade in the heat, but rally again in Autumn. Sweet Alyssum is an annual, but some varieties are hardy in frost-free areas and may survive for several seasons. Gardeners in USDA Hardiness Zones 7–11 may have plants that continue growing all year long, but they may be short-lived. Sometimes they self-seed so much that is seems as if the same plants are surviving, when in reality, new seedlings are filling in. Lobularia maritima is cultivated in gardens, with many horticultural varieties with purple or pink flowers. The plant is best planted in early spring, but requires little maintenance when growing. Although an annual, it may reseed in temperate climates It will flower more profusely if spent blooms are trimmed. When grown in gardens, it is typically used as ground-cover, as it rarely grows higher than 20 cm tall. It is also grown in cracks in paving and walls, and is especially associated with coastal locations. It prefers partial shade, and is resistant to heat and drought. Plants with darker-coloured flowers do better in cooler temperatures. Your photos in this blog are always so beautiful. In our backyard we planted some Alyssum (can't remember it was the same kind) because it was fragrant and it plants itself forth - this is a lovely capture! Beautiful! Such a lovely small flower. Alyssum pops up everyone in between our brick paving! Such a simple little plant and flower with a delicate fragrance, especially in the evening. Thank you for hosting Nick. I have been very happy with alyssum. They reseed so well and hardly need water in summer, so the tulips planted underneath survive instead of rotting. Such a lovely, tender photo. Pretty photo! Alyssum is very popular in my town. It blooms in the spring, then it stays green throughout the season.